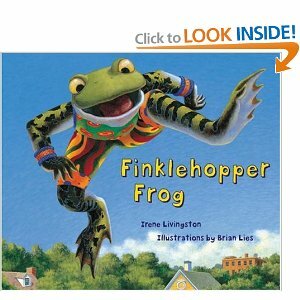 Last night I read Finklehopper Frog by Irene Livingston to my sons. We've read the story many times, from ages 3 to 11 they all enjoy each word. It isn't just an adorable story with fun, bright pictures and characters, Finklehopper Frog also teaches children about diversity and how to celebrate our individuality. I'd highly recommend you read it to your children. It'll make them laugh and hopefully think. I was just googling Finklehopper to see how he's been doing lately. Pardoon any typos, I have Macular Degeneration now but get by pretty well with my magnifyers. It's loovely to read about people's enjoyment of my Finkle. It was fun wwriting it. Seems to be still going strong since he first hopped out in 2003 I guess you've read the sequel, Finklehopper Frog Cheers? How wonderful to hear from you! I did not know there was a sequel. I am going to google it and buy it for my boys right now. They will be so thrilled. Sorry to hear about your Macular Degeneration. Thank you for creating such wonderful children's literature. Aw, so nice to hear back from you Cami. I wasn't trying to promote Finklehopper or as my Publishers used to call him Da Fink. Jist wanted to connect.So nice to find he's still going strong. You are wonderful. It's so fun to connect with you! Aw thank you for for them-thar kind words Cami. Let me know if you get K=finklehoper Frog Cheers. It'd be interesting to hear if your boys liked it as well as the first book. core based Replica Rolex Watches Depraz Module 87 Dubois, loading time module combination of the five question two movement, which is currently on UK Replica watches the market the most popular time table entry program. The classic design of nostalgia, coupled with the combination of Designer handbags patent material and complex performance, the PW1 Repetition Minutes Argentium to Watches Replica become a model of contemporary interpretation of handbag replica classical watch technology.